People at high risk for Type 1 diabetes have smaller pancreas than their counterparts with no risk factors. This important finding, published in the Journal of the American Medical Association last year by Martha Campbell-Thompson, Ph.D., and her research team, has led to a large new cross sectional study funded by the National Institute of Diabetes and Digestive and Kidney Diseases that will help researchers better understand the natural history of the disease and may one day help lead to interventions to prevent it. 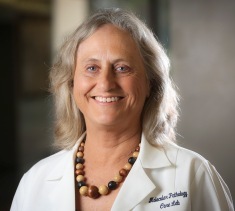 By using non-invasive tools including MRI and ultrasound, University of Florida researchers will measure and estimate the pancreas volumes in four sets of individuals: people at risk of developing Type 1 diabetes with autoantibodies; people who have recently been diagnosed with Type 1 diabetes; and people at little risk of developing the disease who are matched with the other groups based on age, gender, and BMI. They plan to recruit 100 patients per year for three years, from Florida and across the southeast region. The Pancreatic volume in subjects at risk for Type 1 diabetes study will help determine whether people at high risk of Type 1 diabetes start out with a smaller pancreas volume or whether the beginning of the onset of the disease causes the pancreas volume to shrink. Either conclusion will provide essential insight into this disease. The research team is comprised of Martha Campbell-Thompson, Ph.D., Michael Haller, M.D., Desmond Schatz, M.D., Bimota Nambam, Ph.D., Mark Atkinson, Ph.D., Jonathan Shuster, Ph.D. and Jonathan Williams, M.D. Learn more about the study by calling (352) 273-5580 for more information.